The film we would like to discuss today is Charro! NOTE: Please be aware that the exclamation point in the title of this film is intentional, and not something we placed there. Very important. 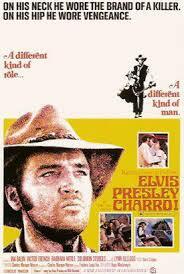 This 1969 western starring Elvis Presley is a landmark in Elvis’ movie career, as it stands alone. It is the only one in which Elvis didn’t sing any songs. It’s also the only one in which he wears a beard. The film is the story about gangs, thievery, violence and deception. Originally, a young Clint Eastwood turned down the roll that Elvis gladly accepted in the hopes that it would launch his career as a serious (read: non-singing) actor. He loved the original script for all its raw violence and toughness. But he was disappointed when he arrived on set to find the script revised beyond recognition. It was a much milder interpretation of a story about a golden cannon that had been stolen from a town by members of Charro’s former gang. The only way he could help the innocent townspeople was to fight his former gang members. Would Charro save the day, or would the gang continue to terrorize the townspeople? You’ll have to see the film to find out.